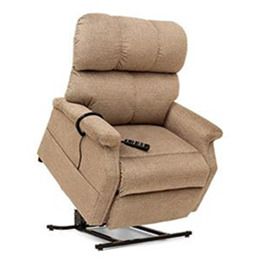 This SR-525PW Lift Chair from Pride Lift Chair's Serenity Collection seamlessly combines superior comfort with top-notch performance for a truly unique lift chair. The SR-525PW features Pride® Memory Foam for enhanced cooling comfort and individually wrapped coil springs for a balanced seating experience. This SR-525PW Lift Chair is available in a wide variety of fabrics including, but not limited to: Deep Sky, Ember, Field, Oat, Timber. Additional Options Include: Head Pillow, Lumbar Pillow, and Footrest Extension.